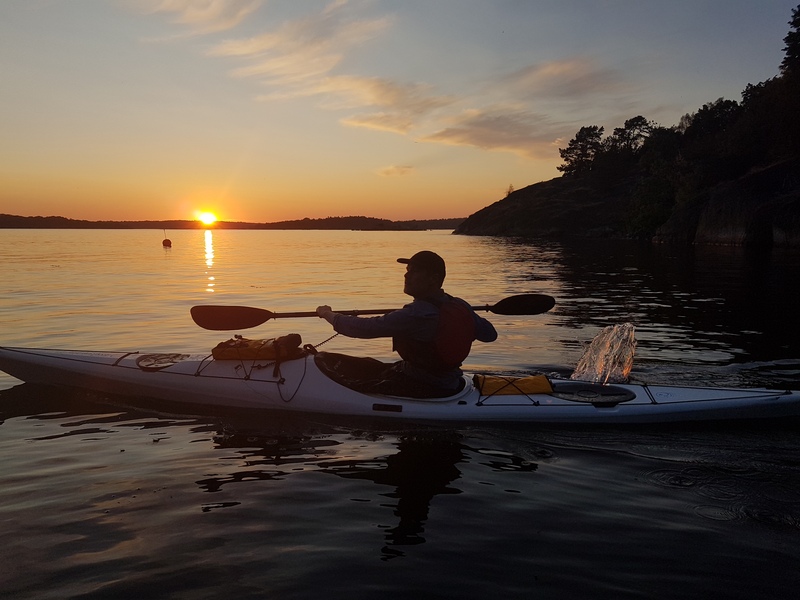 For your convenience we have put together a weekend package for two person in one of our 6-bed cottages focusing on sea kayaking in a UNESCO Biosphere Reserve, Blekinge Archipelago. 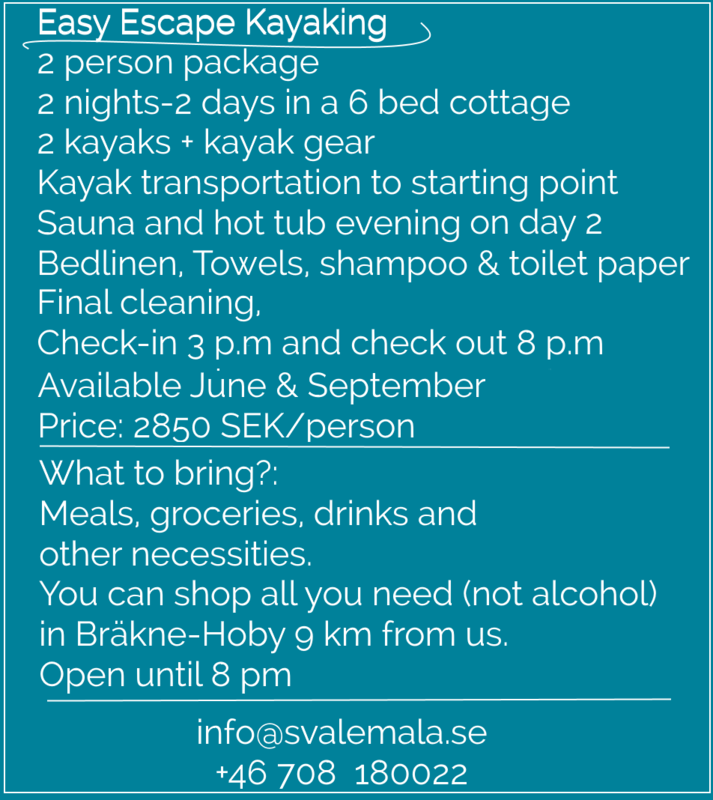 This package includes all the kayaking equipment you need to explore the finest parts of this southernmost archipelago in Sweden. Transportation for both you and the kayaks to the starting point is included, giving you the chance to experience the most of the archipelago in a one-way self-guided paddling back to your cottage. So why is this “Easy”? You don´t have to worry about the kayaking gear, we fix that for you. 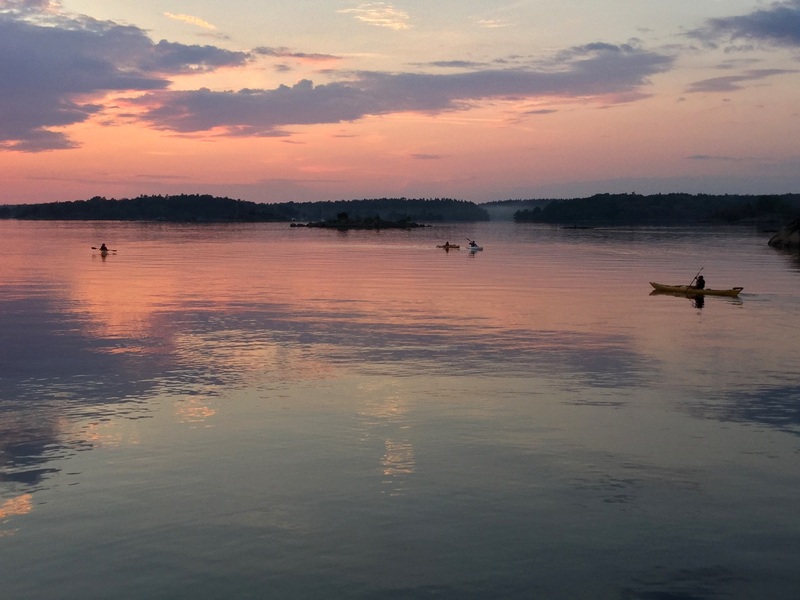 This is a one-day one-way trip where you only have to focus on the kayaking experience. The preparations are done the day before your kayaking begins so you get an early start. We let you choose between kayaking, hiking or biking on day 3. You can also choose doing nothing. That is easy. Do you want to check out really late? Ok that is fine! This is not an outdoor sleeping experience, you sleep comfortable inside your cottage. You only have to worry about clothes and the meals. You can prepare your meals on the stove and keep the grocery in the fridge-freezer and you even have a dishwasher in you cottage. 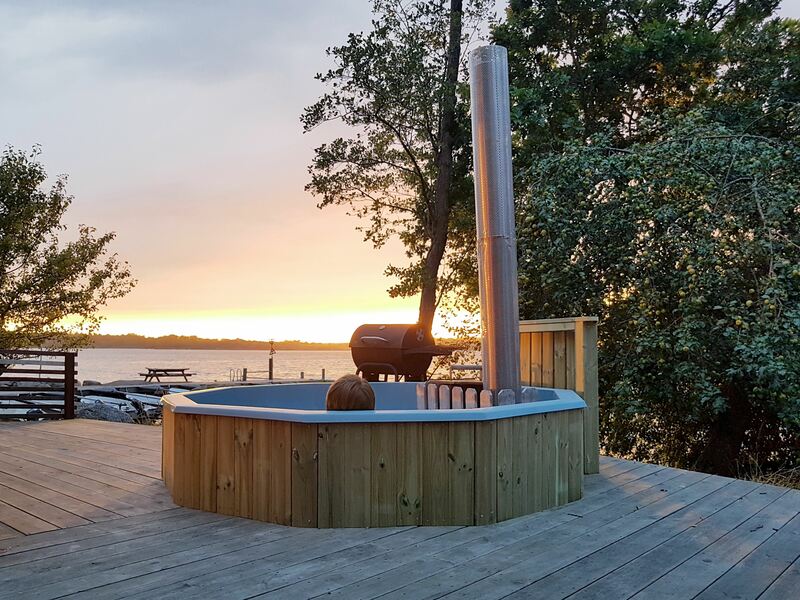 Or why not grill your dinner at the beach while enjoying the hot tub and the sunset on day 2. Read the day-day-program below and send us an e-mail if you have any questions. You can of course make your reservation directly on-line. 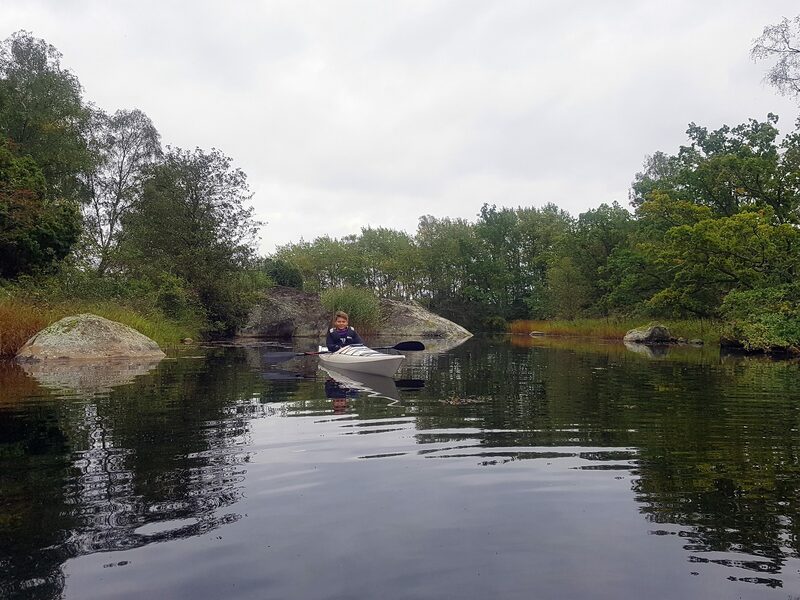 Just start by choosing arrival and departure day in June or September and then choose the “Easy Escape Kayaking” package without choosing a cottage (the cottage is included in the price). We will get back to you as soon as possible with availability and a confirmation. Some weekends are already fully booked and you can get a hint by looking in the availability calendar. Self Check In (3 p.m.) & Free Parking by your cottage. All necessary check in information is sent to you with SMS the day before your arrival. 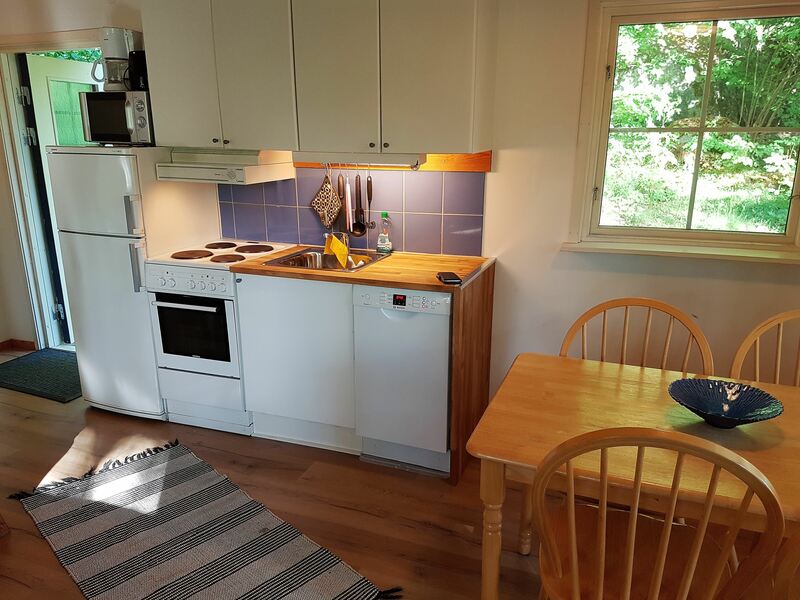 After you have packed your things in the cottage, we meet at the beach to choose kayak, single or tandem ,rudder or skeg and your other personal kayak gear. 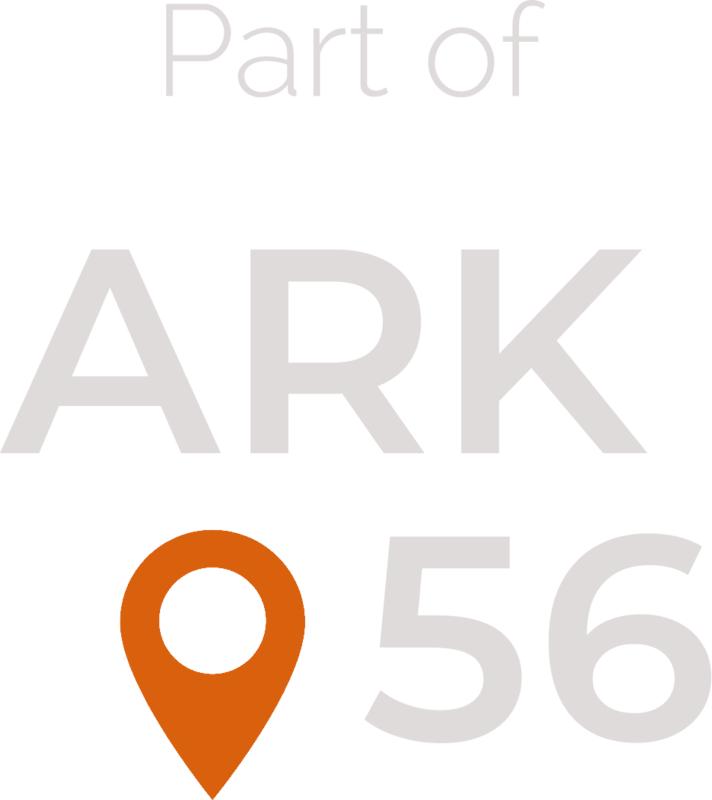 You will get the special sea chart with the route clearly marked. We check the weather forecast for tomorrow and discuss the planned route. If necessary we adjust the trip for your safety. We always have a motorboat ready if you need any assistance during the day of the trip. We agree on the pick-up time for tomorrow. Suggested is between 7.30 and 9.00 a.m. so you have plenty of time for the kayaking trip and a few stops on the way. 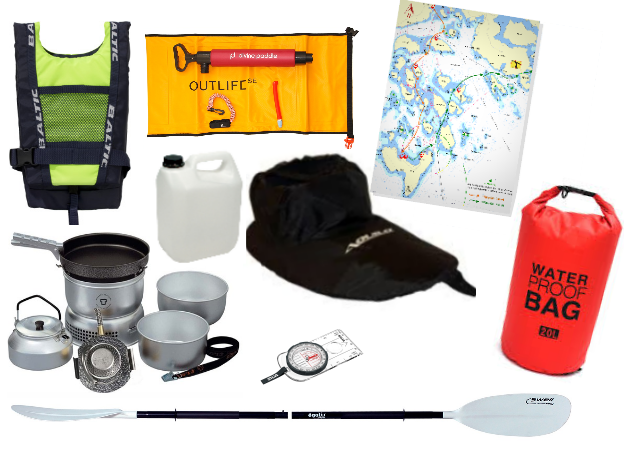 kayak safety kit, first aid kit, compass & map, pack sack 10 L, 5 L of drinking water, spray skirt, paddle gloves to avoid blisters, portable gas stove, toilet paper…….. If you have any questions or need any instructions we will fix that this day so you feel ready and prepared for the main event, the next day´s kayaking trip. This day starts early when you are picked-up outside your cottage. The kayaks and the rest of the equipment are already loaded on the trailer. After a 20 minutes car ride we arive in Matvik Harbour where we unload and launch the kayaks. After a short instruction you start your self-guided day trip from Matvik back to Svalemåla. 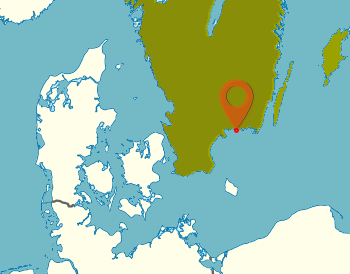 The planned trip starts southwards the outer archipelago and the Island Tärnö where it is time for todays first stop with lunch. Here you can choose to buy something in the mini restaurant/snack bar/shop “Laxboden” or if you prefer to cook your own lunch you have the option to do so using the portable gas stove that´s included in the equipment. 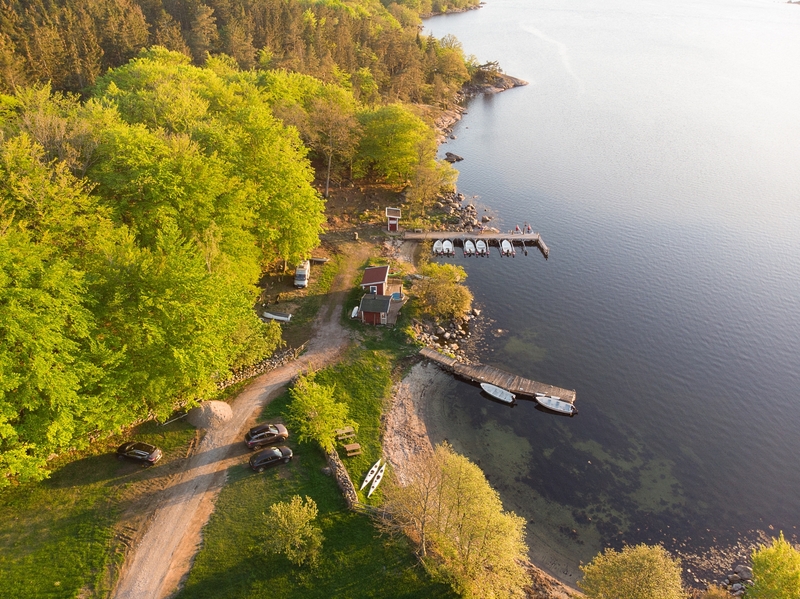 After lunch you should take the opportunity to see a little more of this beautiful and picturesque island and why not hike to the viewpoint Dragon Hill and the small and oldest wooden lighthouse in Sweden. 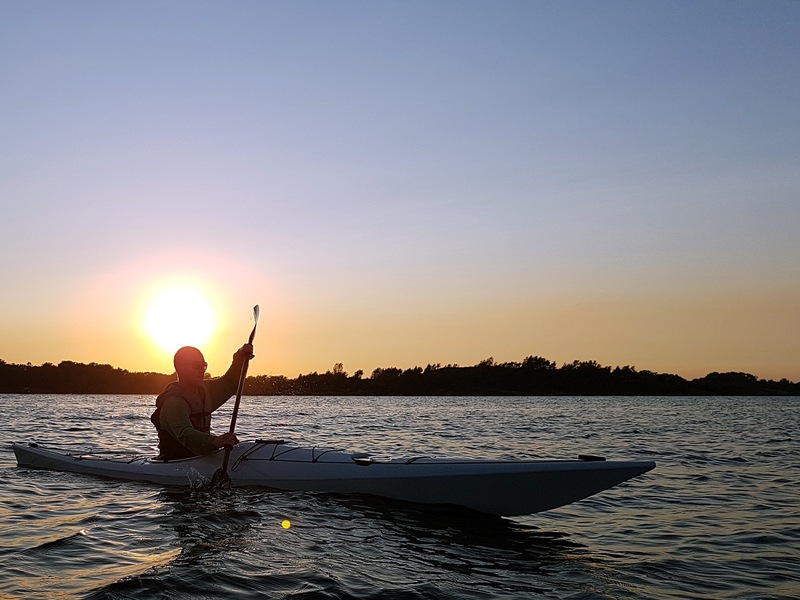 In the afternoon the kayaking follows the marked route northeast and you have 3-4 hours of paddling through the beautiful archipelago of Hällaryd and Järnavik. Back in Svalemåla the wood fired hot tub is ready for you by the beach. Late check-out time (8 p.m.) gives you plenty of time to experience more of the outdoor activities right outside your cottage or just relax. 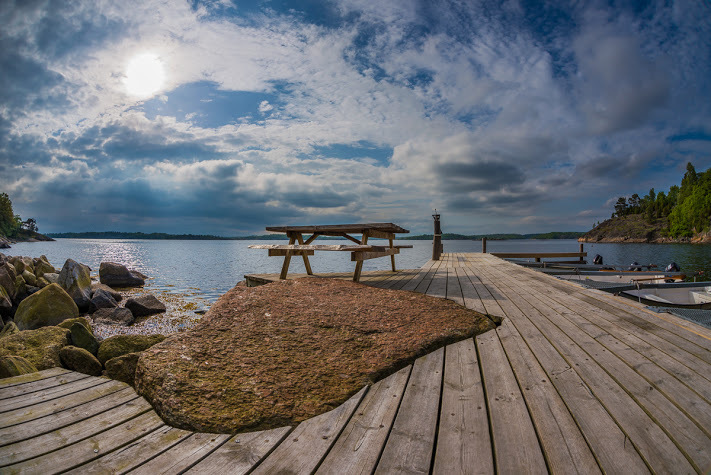 Do you want to explore more of the archipelago in your kayak then why not have your lunch on the island Tjärö? The restaurant is only 1 km of paddling from our beach. 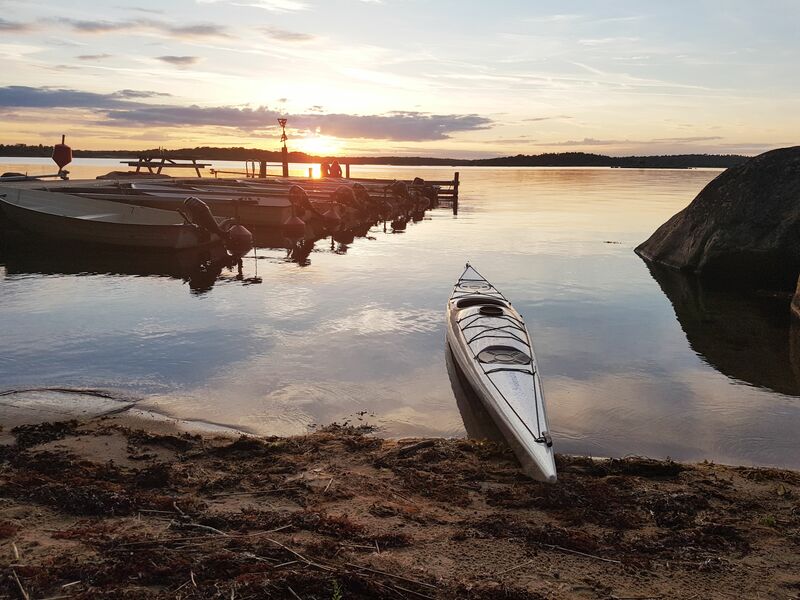 A round-trip in the kayak around Tjärö after lunch can be a good choice if you want to explore more of the Järnavik archipelago. 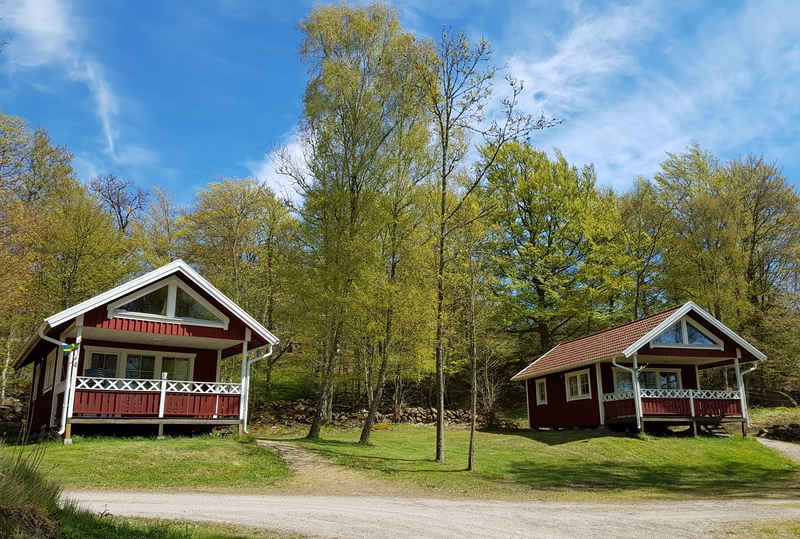 Do you prefer to borrow one of our bikes and follow the southern part of the Bräkne-Trail on wheels or hike the local “Svalemåla Trail” and “Blekinge Trail” on foot? 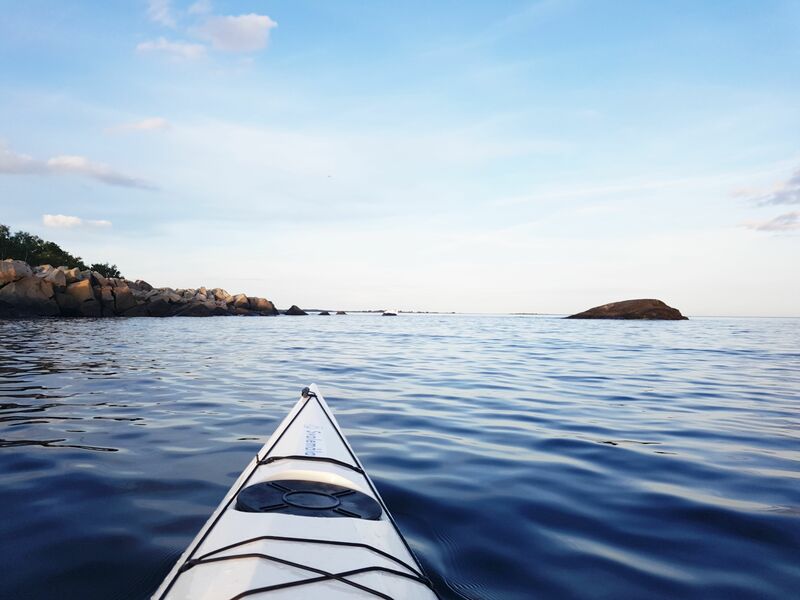 Glide through the water, round a cape and discover something new and unexpected, paddle among hard, bare rocks in the outer archipelago that is formed both by the ice age and the waves of the sea. Paddle in the lush inner archipelago with its steep granite cliffs that plunge straight into the sea. End this day in a hot tub, a glass of wine, good company and with the sun going down on the horizon. 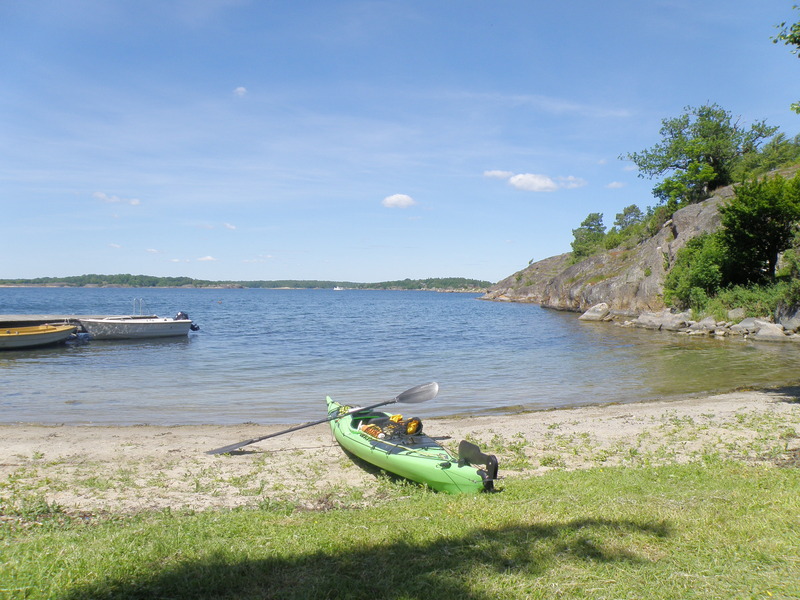 Plan and dream about your next longer paddle trip from west to east in the archipelago of Blekinge. 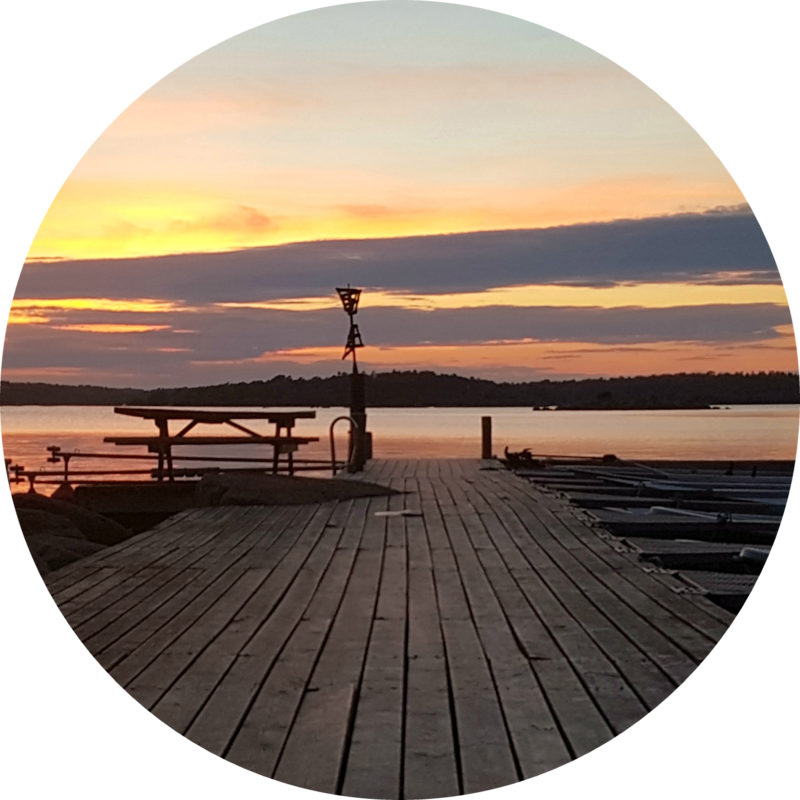 This is an opportunity to easily explore a small and beautiful part of this pristine, unknown gem among Swedish archipelagos.